On the road and with a redshirt freshman at quarterback, few expected No. 14 Stanford (9-2) to keep pace with the high-octane Oregon (10-1) offense. The Ducks had won their last 13 games, and as the No. 1 team in the country, they seemed destined to make the BCS national title game. However, the late game heroics of Kevin Hogan would derail the Oregon season and help Stanford clinch its first Pac-12 championship since 1999. Down 14-7 with a little over two minutes left in the game, Stanford went for it on 4th and 1 at the Oregon 12-yard line. Fullback Ryan Hewitt converted the 4th down attempt, and on the next play Hogan connected with tight end Zach Ertz for a 10-yard touchdown to tie the game. The Ducks opened with the ball to start overtime, but missed a 41-yard field goal. On the ensuing drive, kicker Jordan Williamson connected from 37 yards out to secure Stanford the 17-14 win. In 2013, Stanford (8-1) once again faced a No. 2 Oregon (8-1) squad with the opportunity to spoil the Ducks’ season. Playing at home, Stanford utilized its punishing run game and dominant defense to silence Oregon for the first three quarters of the game. The Cardinal rushed for 274 yards as a team, coming off 66 carries. Running back Tyler Gaffney led the charge with 45 carries, producing 157 yards and 1 touchdown. As a result, Kevin Hogan only threw the ball 13 times for 103 yards, but the quarterback added a rushing touchdown of his own as well. The explosive Oregon offense was limited to just 62 rushing yards, as Heisman candidate Marcus Mariota was held in check most of the night. Stanford held a 26-0 lead early in the fourth quarter before the Ducks began their furious rally. Mariota threw for 2 touchdowns and Oregon returned a blocked Stanford field goal for a touchdown, cutting the lead to 26-20. Oregon would fail to recover a second onside kick, however, and Stanford pulled out the win. Oregon (8-1) took advantage of a down year for Stanford (5-4) football to exact revenge on a team that had ruined its last two seasons. En route to the first-ever college football playoffs, Marcus Mariota picked up his first ever win over Stanford. The Cardinal defense, which had found great success containing Mariota in the past, failed to meet its standards of excellence. Mariota threw for 258 yards and 2 touchdowns, while rushing for 85 yards and 2 scores as well. As a team the Ducks rushed for 267 yards on the ground, while Stanford only produced 132 yards. 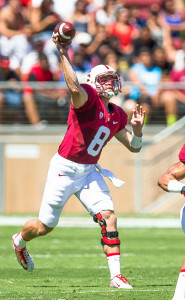 Playing from behind, Stanford was forced to rely on the passing game. Hogan threw the ball 29 times for 237 yards, but never found the back of the end zone. As a result, the Ducks cruised to an easy 45-16 win.